In the words of Roger Franklin, fire can be "a curious, wonderful thing". On February 7, 2009, however, there was nothing wonderful about the flames that engulfed Victoria, killing 173 people and reducing several towns to dust. 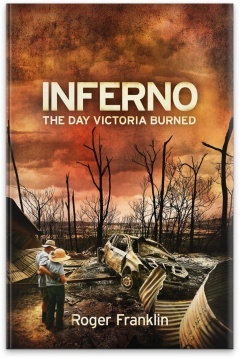 Franklin's book, Inferno: the Day Victoria Burned, is the first to explore the horrors of the day that will forever be known as Black Saturday. Not only does the author explain what happened that day – individual heroism, unimaginable tragedy, tales of towns all but wiped off the map – but also why it happened. The author examines the roles of the Victorian government, the CFA and the local councils that were so determined to protect roadside vegetation. He analyses the pros and cons of preventive burning, questions the merits of the state's controversial stay-or-go policy, and delves into the mind of an arsonist. Through it all, there is a clear message: failure was everywhere on Black Saturday. And with bushfires a constant threat in Australian life, Franklin cites many important lessons that need to be learned if such a disaster is to be avoided in the future. No stranger to catastrophe, veteran journalist Roger Franklin has covered disasters and debacles in Australia and the U.S. for more than three decades, from the Granville train crash to the 9/11 attacks on New York. Formerly a senior writer at the Herald Sun, he has been a writer and editor for the Sun-Herald, Time magazine, BusinessWeek and the New York Post. He is the author of The Defender: the Story of General Dynamics, a critically acclaimed exposé of waste, fraud and abuse at the Pentagon. Inferno was his first for The Slattery Media Group.